Grand Way has been manufacturing highest quality knives in the USA since 2003. Our knives always utilize high quality stainless steel that is optimally adapted to tasks for each knife is intended to use. Professionals worldwide trust the quality materials and excellent craftsmanship of Grand Way. EXCELLENT PERFORMANCE: High-quality stainless steel (420 grade) provides excellent edge performance allowing razor sharpness, high hardness rating (HRC 56-58), exceptional toughness and superior corrosion resistance. Stainless steel blade stays sharp much longer than carbon steel and is far less prone to rust. To improve corrosion resistance, clean and oil the blade regularly. MULTI USE: The outdoor knife is a great tool for chopping small limbs, cutting and preparing tinder for a fire, or can be used to carve tools that helpful within your campsite or for survival. The camping knife blade easily carves thin slices and performs the most delicate camp food preparation. It is also a great tool for skinning and filleting. This tactical knife is the best choice for any outdoor use like camping or hunting; can be your companion for living in the bush or help surviving in difficult cases. CONVENIENT HANDLE: The tactical survival knife comes with a patterned, high-friction grip handle that performs well in wet and cold conditions. The field knife sits comfortably in the hand providing greater control, safety and performance. FREE BONUS: The stainless steel knife comes with a free sheath. This solid and practical holder allows you to wear the combat defense knife on your belt. The multifunctional sheath is made of heavy duty black cordura fabric. Still in doubt about a new universal knife? Do not hesitate and click "Add to Cart" at the top of the page and receive GRAND WAY (148109) best black tactical knife for men and women with a 10-YEAR WARRANTY in couple days! KNIFE FIXED BLADE is extremely sharp and durable; provides superior control and greater down pressure when cutting, slicing, chopping or piercing. Useful in combat and self-defense training exercises. BEST OUTDOOR CAMPING BUSHCRAFTING HIKING BACKPACKING KNIFE is lightweight and does not add much heavy on you journey. Good choice either for everyday carry or any outdoor use. TACTICAL SURVIVAL DEFENSE HUNTING KNIFE provides razor sharp cutting performance and high durability. Equipped with the safety guard and comfortable anti-slip handle. STAINLESS STEEL KNIFE FOR MEN WOMEN BLACK made of 420 grade steel, provides excellent balance of hardness and corrosion resistance ensures proper operation without sharpening. 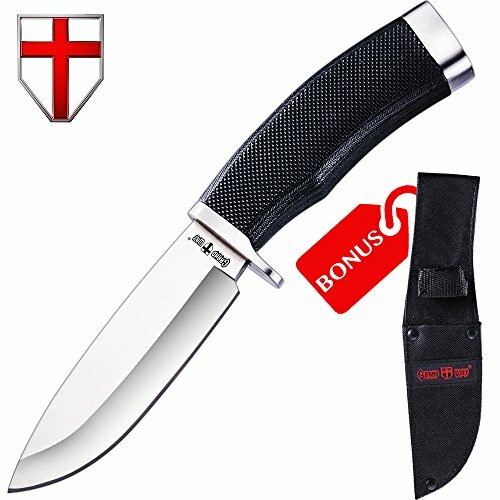 BUY UNIVERSAL KNIFE with a BONUS SHEATH made of heavy duty cordura fabric and GET 100% SATISFACTION or get a refund if you experience any problem with a product.